In a prologue, we see Lord Fergus and Lady Elinor in a forested area, celebrating the birthday of their young daughter, Merida. Though Elinor happily plays with Merida, she grows perturbed when Fergus gives the little girl her own bow and set of arrows. As Merida tries to hit a target, one of the arrows sails off into the forest nearby. Merida runs off and retrieves it, but soon encounters a glowing blue willo-the-wisp. Going back to her parents, she tells what she saw, and her mother explains that they can lead a person to their destiny. Suddenly, the mood is broken as an enormous black bear enters the camp grounds. 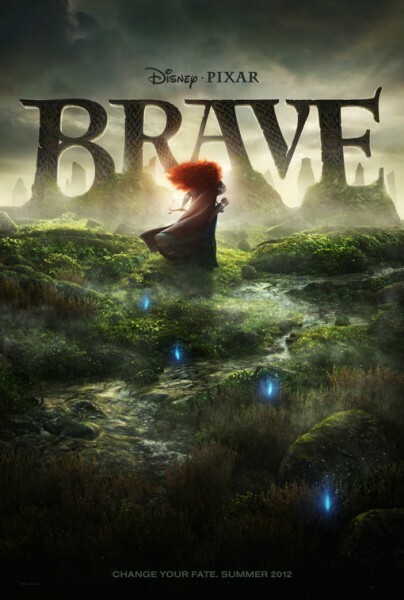 Merida and her mother quickly take leave as Lord Fergus and his men fight against the bear. Time passes, and we see that Lord Fergus has lost his leg to the bear. In the time that has passed, Lady Elinor has given birth to three mischievous boys (triplets), and Merida is now a teenager. While her mother wants her to be proper, Merida is moreso intent on practicing archery, and journeying off in the forest. One evening, a messenger brings word that the 3 neighboring clans have accepted the offer to fight for Merida's hand in marriage. Naturally, the young woman is not at all happy with this situation. Elinor explains to her daughter that the clans must be kept in harmony, or chaos may reign. She relates the story of how the clans were descended from four brothers, but one of them wanted more power than the others, and caused the balance of power to crumble. Even so, this does little to quell Merida's resentment of the betrothal. The three clans soon arrive, and Lords MacGuffin, Macintosh, and Dingwall arrive with each of their sons. Per tradition, each of the first-born of the clans will fight in the event that the Princess chooses. This causes Merida to perk up, and she eagerly suggests archery. When it comes to the sport, almost none of the sons are good at the sport, but everyone is shocked when Merida appears before everyone, claiming that since she's a first-born as well, she'll be 'fighting for her own hand.' Elinor demands Merida stop, but she defies her mother, and makes a bulls-eye on each of the targets. Naturally, Elinor feels angry and humiliated at this, and both mother and daughter have a heated conversation in her room later on. Merida claims she does not want to be like her mother, and in anger, slashes a tapestry depicting the family, slicing a hole between her and her mother in the piece. Upset by this as well, Elinor loses her temper, and throws Merida's bow in a fireplace nearby. Upset by this, Merida flees the castle. Unseen by Merida, her mother regrets what she has done a few moments later, and manages to retrieve the bow from the fire.